The simple and refined beauty of English garden landscape design can blend easily with a variety of home styles and is becoming a popular outdoor design theme for fine home owners around the world. Gracious curves, lush green lawns, and fragrant, colorful blooms can transform your home into a relaxing outdoor hideaway, reminiscent of the tranquil English countryside. The traditional has its roots in the English culture. It is most noted for the array of beautiful roses, other fragrant flowers and abundant, lush plant life, as well as the romantic element of secluded sitting areas and meandering walkways, covered with creeping vines and majestic shade trees. Incorporating an English garden landscape design into your own property is simple. With the right landscape design materials, carefully selected patio furniture and outdoor accessories, you can create the perfect garden for your afternoon tea or relaxing with a glass of wine. 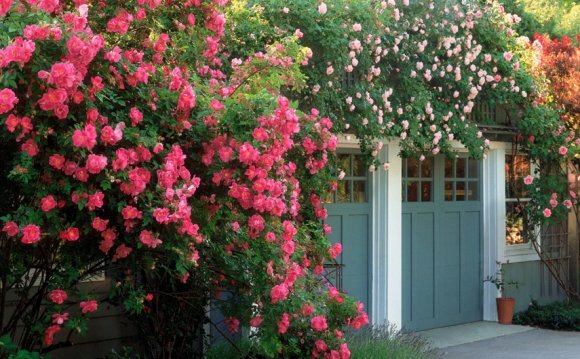 An English rose garden has the power to enchant and inspire. On a warm summer’s evening, a stroll in an English rose garden ranks among the best of life’s experiences. We all have the opportunity to build a garden, whether it’s on an apartment balcony, several acres surrounding a home or a small backyard. New varieties of old plants allow us to build English gardens in smaller spaces, so that any garden can display a burst of color, fragrance and texture. You’ll find that some roses have been specifically hybridized to resist diseases and insects and display a profusion of exquisite flowers, brilliant, fragrant and long-lasting with blooms that appear by the hundreds all summer long and into the fall. They are excellent for creating a privacy wall and screening unsightly utilities. Winding pathways surrounded by flourishing plant life are an essential part of English gardens. Whether you’re strolling through the garden under the light of the moon or enjoying the afternoon breeze in the midst of the sweet floral aroma, the design of your garden paths should add an element of romance and an air of mystery to your outdoor design. Gravel is economical and easy to maintain. Bark is another inexpensive, yet beautiful, flooring option. Interlocking stone or brick pavers add an elegant charm to your English garden design and typically blend well with modern home styles. The English garden style boasts a relaxed, free-flowing ambiance. Design paths to be functional, but primarily to enjoy the beauty of your outdoor space. Opt for curves and soft angles in your landscape design rather than straight lines and sharp corners. Allow colorful flowers, sprawling greenery, and aromatic herbs to gracefully brush the edges of your paths for a natural, rustic appearance. Combine various path materials for a more authentic English garden look. Stone pavers are a nice match for both gravel and brick. Choose natural, unobtrusive colors for pathway materials. lawns that allow you to enjoy the charm of your outdoor space. The furnishings and décor you add to your garden design can greatly influence the overall theme of your outdoor area. • Outdoor furniture with a weathered appearance is typical. Hardwood or teak garden furniture typically complements the English garden style. • Design sitting areas to overlook the most scenic spots of your garden. Rustic garden benches and small tables with chairs are perfect choices. richly sweet roses, fragrant honeysuckles, and a variety of other aromatic and attractive plants for a natural oasis that makes an ideal reading spot. Traditional English gardens invite an array of insects and animals that add to the quaintness. Knowing that your garden is providing a haven for wildlife will give you a closer connection with the nature. Activities such as watching birds feeding or playing in a bird bath can lift the spirits and improve your sense of well being. Bird houses are one of the easiest and most beautiful additions to an English Garden landscape design, and they invite numerous species of birds to make a home in your outdoor area. accomplished rather quickly. There are limitless types of bird house designs, so finding a style that’s right for your outdoor area is easy. Create natural animal habitats with decorative arrangements of rocks, branches, or other natural elements. Ponds and natural waterfalls are scenic additions to your garden and are inviting to birds, frogs, and other wildlife. Select plants that attract butterflies, insects, and hummingbirds, like lavender, clover, and asters. Make your garden alluring to birds with colorful berry bearing shrubs, decorative bird feeders, and rustic bird baths. A natural, meadow style yard design will be the most appealing to native wildlife. Tranquil gazebos and scenic bridges make charming additions to your English garden landscape design. The English garden style is full of natural charm created by an abundance of colorful, untamed plant life. As with any landscape design, it is important to select a variety of blooms and shrubs to keep your yard colorful and vibrant year round.